This popular 5-ounce Red-Top, Measured Wine Pourer is used by restaurants, bars, wineries & wine clubs for serving wine-by-the-glass. Provides consistent pour size and reduces costs by preventing over-pours. The 5 ounce portion size will yield 5+ pours per 750ml bottle (25.35 ounces). 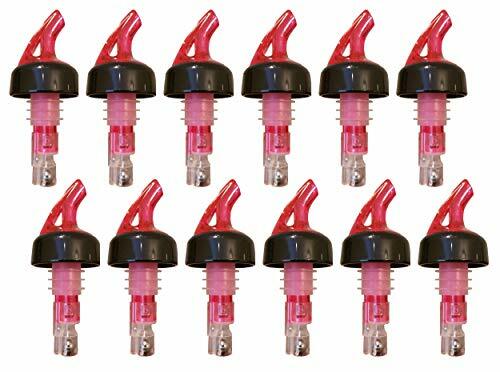 Price is for 12 red-top portion wine pourers. This is the world's only 5-ounce measured wine pourer and it is manufactured in the USA. Comes with a red top and is designed for serving wine-by-the-glass in restaurants, bars, wineries, wine clubs and at home. Provides a consistent pour size and dramatically helps to reduce costs by preventing over-pours. The 5-ounce portion size will yield 5+ pours per 750ml bottle (25.35 ounces).